Heart is heavy, explained by genetic memory linked with stolen sisters and taken brothers. Decolonize and realize that in civility reality becomes a fallacy, forced into this mentality, inferior to the superior, stories with white heros, taught by monsters who have mimosas during games of golf. While I waste my time trying to understand why traditions like Thankstaking still stand on native land, and as we yell racism making accusations creating noise that destroys the real issue. A ploy from UNLEARNING white is right; and that dark/ an exotic space meant to be explored, exploited, expendable. Well, the people have you had enough? You learned their forked tongue and learned their tactics, have you had ENOUGH. Solidarity means more than sincerity. Commitment to action to people; freedom from evil. Don’t reason with the weasel. Rise with the eagle. 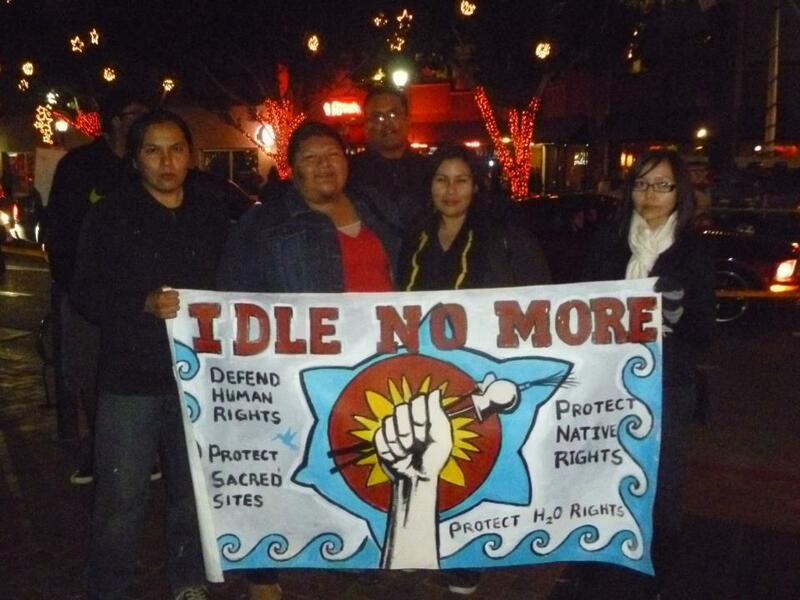 #IdleNoMore has gained attention from all over the world. 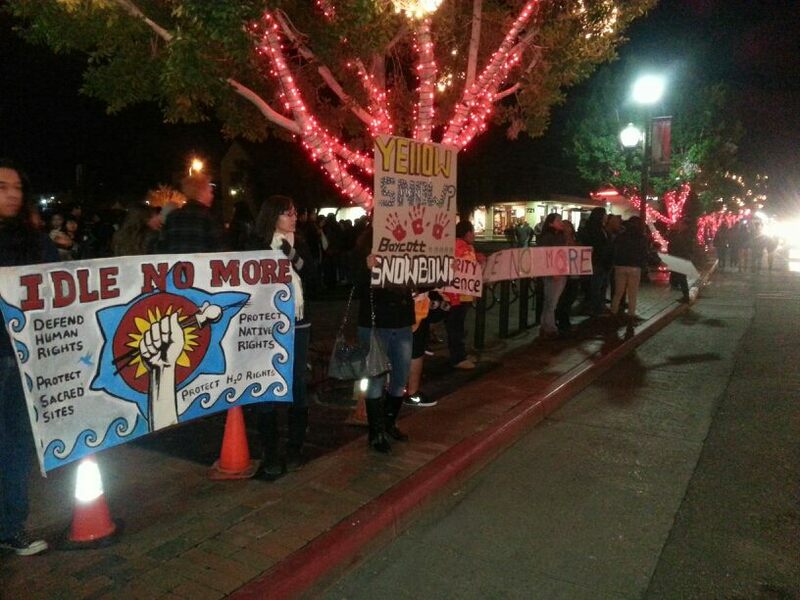 I took the opportunity to attend the Los Angeles #IdleNoMore protest at the Canadian Embassy on 12/21/12. It was my first protest and I got to share this experience with my little sister. At this time I didn’t know much about #IdleNoMore except that it mainly concerned First Nation Canadians. 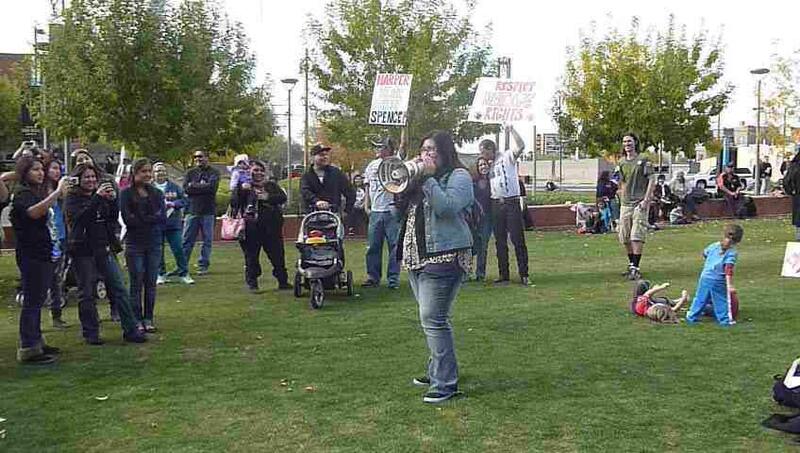 Once I got back in AZ there was a Round Dance Flash Mob being held at Arizona Mills Mall in Tempe. I was excited because I saw a picture of the Edmonton mall RDFM and felt privileged that it is taking place in AZ. http://youtu.be/RyFtIuponuc This link will take you to my video that my sister shot at the RDFM. Overall the experience was short and entertaining. After that RDFM I then attended the Tempe Marketplace RDFM, Metro Center Mall RDFM, Scottsdale Fashion Square RDFM, Downtown PHX rally, and New Years Eve Round Dance on Mill Ave. I then had the honor of planning the RDFM at Westgate during the Fiesta Bowl and the IdleNoMore Potluck social at the Puente building. After the potluck a core group of us collaborated with Puente and held a Art party so we can make signs for upcoming protest. One event that wasn’t successful was the 2nd RDFM at Scottsdale Fashion Square. I was one of the host, however did not partake in planning the event. The other host told me she got permission to have the RDFM at Fashion Square again, however when we got there the Mall manager and security threatened to have us arrested. And the other issue is that the drummers cancelled last minute. Leading an event is something I prefer not do I rather be that person that shows up and participates. Organizing is a lot of responsibility and hard work. People become organizers because they are really passionate about a cause so that’s the reason why I obligated myself to become an organizer for some of the #IdleNoMore events in AZ. I learned a lot and have met many awesome, good, smart, funny, giving, humble individuals that will have a lasting impact on my life. 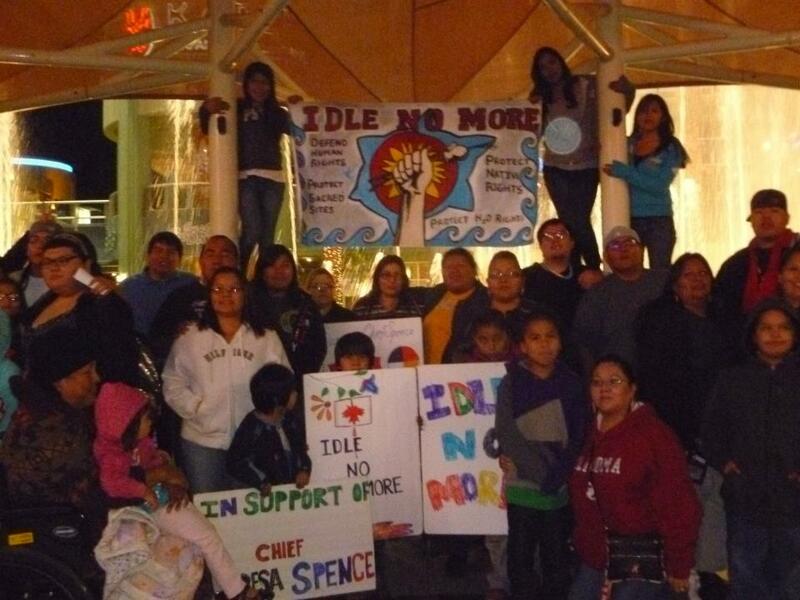 I will forever be thankful for the Idle No More movement because it helped me find my voice, helped create a space for discussion on environmental and human rights issues and created a sense of community among the Indigenous people of the Phoenix metropolitan area.